Book Blurb: Jessie Selkirk has a mission — to take care of every stray cat she finds. They are her life, her sole reason for being. But when Baldwin Rutledge steps into her barn looking for a cat, she develops a whole new interest. One in which she must continually remind herself there is no future. No. Best to hope for nothing beyond friendship and spare herself a broken heart. A single raised eyebrow was his answer. “Then you see my dilemma.” She sat back. “True.” Baldwin winced at her loud exclamation. Too bad she didn’t know how to control her volume. 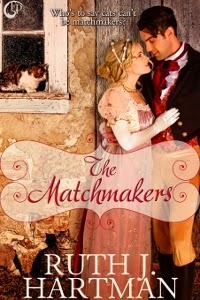 My Review: The Matchmakers is hands down one of the funniest and most endearing novellas that I have read in quite some time! With its unique story-line and over the top yet lovable and quirky characters such as Jessie, Agatha (who was probably my favorite character aside from Aunt Esther), The Matchmakers pulls you in and has you laughing from the very first sentence up until the very last line. I devoured this book in one sitting, not even noticing how much time had passed I was that caught up in the books. Ms. Hartman has a wonderful way of telling a story that draws the reader in and keeps them interested. Each of her stories continues to be different from the last, each with its own set of characters that are just so human that it is impossible not to like them! I especially liked the element of "crazy cat lady" that was present in the main character Jessie. Being a cat lover myself, I was immediately endeared by her and her sense of wanting to protect and care for all of the cats she had taken in. Regardless of the fact that it made people look at her and treat her differently, Jessie never gave up on her cats, or her sense of duty towards them, and I found that to be admirable. The fact that the cats played an important role in her finding her happiness at long last was an added bonus to the novella, and one that in my opinion sets it apart from others of the same genre. A sweet romance filled with humorous and witty dialog, The Matchmakers is sure to satisfy! NOTE: I received a complimentary copy of this novella in return for my honest review. This does not in any way reflect upon my review. All thoughts/opinions of this novel are 100% my own.